SYNOPSIS: No doubt that some older film fans may remember catching these films as kids during the late 60's at a Saturday afternoon matinee. Or maybe later in the early 70's as grade school filler pouring from a 16mm film projector. 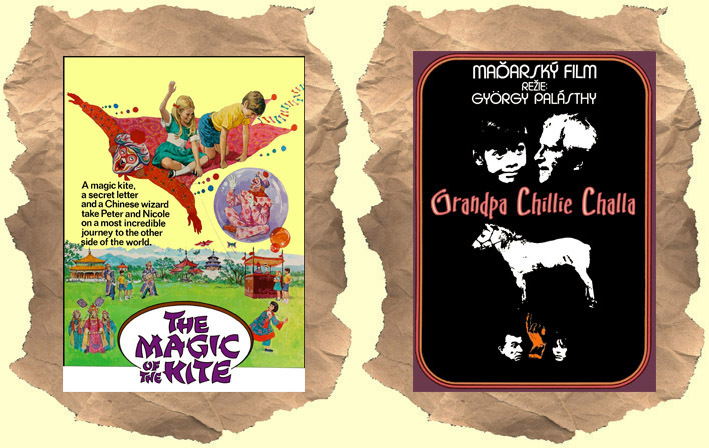 Magic of the Kite: Classic late 50's / early 60's children's film that owes at least a nod to The Red Balloon. A young boy looks for adventure with his friends on the streets of France. They find a stray kite with mysterious Oriental artwork and writing. A local Chinese man reads the text and the boy is even more intrigued. That night the figure on the kite comes to life and appears to the boy and his little sister. He then sends them on a trip to China - in a flying bed! Once in China their adventures continue. Shot in France and China. Grandpa Chillie Challa: This is one of my favorite "Kiddie Matinee" type films up for sale on this site. Young Billy is a lovable but irresponsible boy who lies and schemes his way through life. He has a magic Grandpa Chillie Challa whom he calls on whenever he gets in trouble. Needless to say, the wild solutions always backfire and get Billy into deeper trouble. Some fun special effects in this imaginative film with a growing house, a robot version of Billy, a sad talking snowman. Funny performances too - especially from Billy's exhausted father. Shot in Hungary. WIDESCREEN.